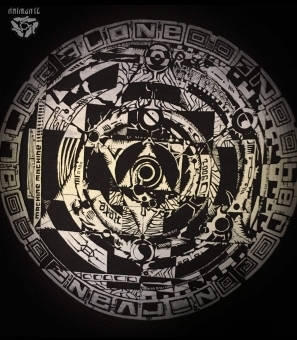 The All Alone Design was drawn by Sputnik for TKO (Teknoost) Soundsystem already in 2006 and now I`m really glad to be able to screenprint it for you. The style seems dark somehow and not really easy to describe, but anyway it has something mystical for me. The first 25 pieces that are now available are colour gradient prints from dark to lightgrey, sand and back to light and darkgrey. The small front Logo is on the sleeve, on or next to the pocket, down on the left side. 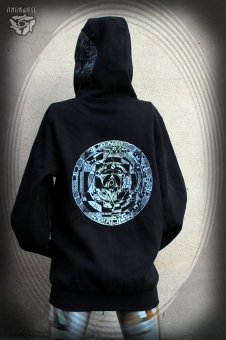 Cloth: Absolute comfort hoody jacket in extra warm and fleecy quality. 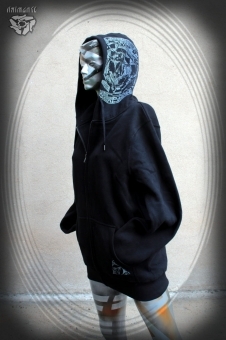 Big, round, three piece and double layered hood <3, YKK metal zip, kangaroo pockets and extra long sleeves. 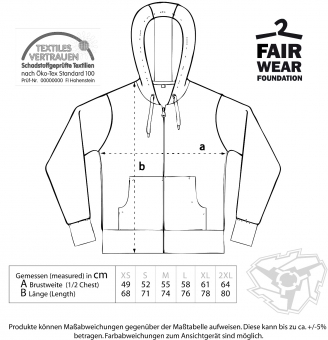 There is also a cable hole in the left side pocket (320g/m², 80% cotton + 20% Polyester) - Fair Wear Foundation and Confidence in Textile ( OEKO-TEX® Standard 100 ) certificates. Print: Absolute durable, waterbased, GOTS certified ink, best quality screenprint, handmade in Dresden.